The world wide web is huge. And once in a while, we fall on really interesting websites. Or a fellow web user points us towards one. I will be sharing some of the cool websites or apps I found on the web with you. I hope to see yours in the comments. Date found: 4th September, 2014. A screenshot of the website. 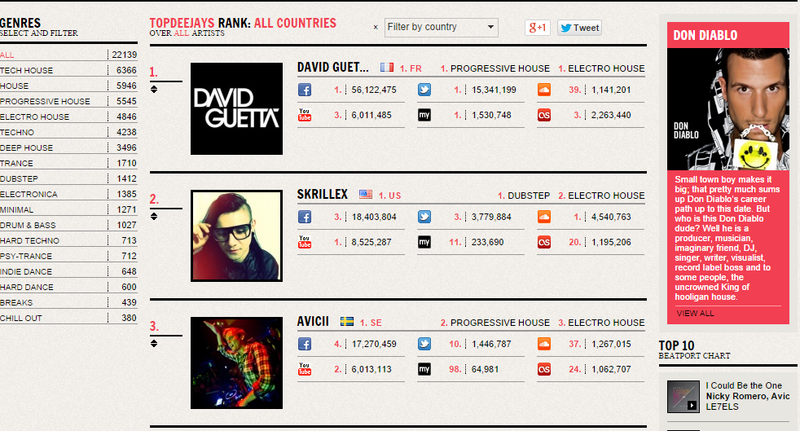 David Guetta,unsurprisingly, ranks 1st. I used to be a partial fan of Dubstep music (and still get occasional headaches when I listen to Skrillex) but it seems my true dubstep nature is finally coming out of the closet. I had just started listening to Zomboy’s 2014 Album (The Outbreak) and in the quest for more … #dubstepness, I asked my buddy Bine ( cool guy, laid back, autodidact, music producer, graphic designer etc.) for an artiste I could enjoy. So he pointed me to the site via text. Thanks again bro. “Topdeejays is an organized global DJ database founded and operated by FM Agencija, d.o.o. It offers visitors a chance to browse through categories (genre, country or social network) and look at their favorite DJ’s profile where they can find links to the DJ’s social media and their statistics, listen to tracks from Soundcloud and Beatport or watch videos from YouTube. To make browsing easier, DJs are ranked by their social media popularity and there is also an indexed search available for those who already know who they are looking for.”-from their website. Let me try the app on one of my pages. I suggest you check it out and tell me what you think. But…wait….IS THAT NOT #HEINPERE by @StanleyEnow?? ‘But Na Bad tin For Copy?’ That is what my roommate said when he heard @StanleyEnow’s song playing over the stereo. I should not judge. So I won’t. I’ll just give my…hum…opinion. Do you know Stanley “Bayangi Boy” Enow? Cameroonian. Artiste. Musician. Won Best New Act at AMMA 2014 . Has a Wikipedia page ( really cool by the way). Has been proclaiming the Cameroonian music scene globally. 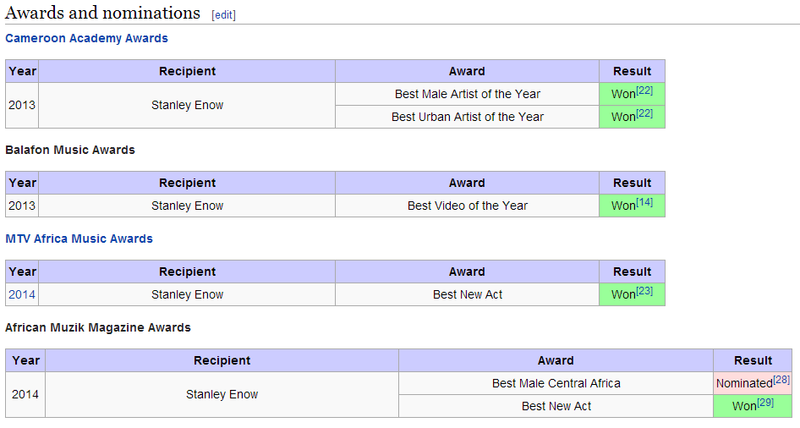 Screen Shot from Stanley Enow’s Wikipedia page. Oh…and the ladies just can’t get enough of him. I think. DISCLAIMER: This is in no way an attempt to dis the artiste mentioned within this post! I write no gossip column and I would not wish to attract fan hate. Also, the only award I have so far is my mother’s love( and I’m truly satisfied…for now…) plus I don’t think I will be able to sing. I tried and almost killed my neighbours. The doctor cautioned me to discontinue…for their own good. The Cameroonian music scene has experienced a massive change. The gridlock that seemed to exist has been solved and everyday on social media and the web new artistes pop( not unlike mushrooms :)) and the sheer talent is amazing. There are numerous young men and women who work hard each day to express their talent and love for music. Stanley Enow, Gasha, Magasco, Ciana, BJ, FluriBoyz, Jovi….there is a music revolution. A #muvolution. ( TM patent pending!!) Awards…music videos…fame…money…I don’t know what the urge to make music is (see explanation above) but what is clear is that music speaks to the soul. Everybody loves music. Music soothes, it solves, it can be timeless, it can be priceless and it can be motivational. Sometimes, when you begin your day, just the right tune could make it shine. Music is indispensable and good music is irreplaceable. That said, I must admit I am a sucker for opinions and by the end of this … ‘discovery’, you should draw your own conclusion. If you are a fan of Stanley Enow you might not want to read this. I repeat: do not read this if you like/love/adore Stanley Enow. This is for your own good. At least I tried. Now, for those who understand copyright and the other legally binding aspects of intellectual property, I would really love to understand how this works. Please do explain to me in the comments or send me an email (if you don’t want to be…involved. I understand). Because I have nothing to say(literally),I will be extremely brief. Remember Zangalewa Vs Shakira ? Or how about Manu Dibango Vs The King Of Pop? This post by ace blogger Dibussi Tande will refresh your memory. What if I gave you: Chris Brown VS Stanley Enow? Just click on the Youtube links below and find out for yourself. http://www.youtube.com/watch?v=j-lBqIP7KfU http://www.youtube.com/watch?v=Rcc2dAkaOcY I am still confused…so I’d be glad if you told me what to make of this. My friend asked me whether it was a bad thing to ‘copy’. Is this copying? If is it not, then what is this? If it is then what…so many questions…my so little brain. Let me get this out of the way first: I stand by my views -always. That is why I have always been explicit about my stance on Jovi’s music– I don’t like his language. He is crude and raw. But here is the other truth: He is true to himself. He sings about his life and his society. He says what he believes in. He is proud of his music AND his roots. 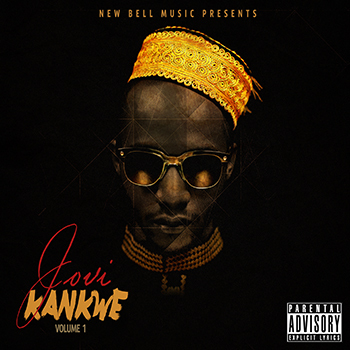 I have never given a review for a music album,let alone an EP, but #Kankwe Volume 1 by ace Cameroonian musician and record producer ;@JoviLeMonstre, deserves it. I will (of course) give my opinion on each track. The album is free. If this album was sold, it would definitely have been worth every CFA. I downloaded and listened to the whole album on repeat the whole afternoon for some time. The blend is incredible. I would have expected to get more of the great Andre-Marie’s voice but Jovi was all over the place with ‘Fufu Witi Njap’. When was the last time you saw the word ‘Fufu’ in a song title? IKR? Sweet! Normally, only a real ‘Don For Kwat’ will understand the jargon. He speaks in the language he knows and understands- that is why the majority can relate with him. A plea…maybe? I suppose it is a national one. But I find this song much more…jovial. He is happy here. He is proud of…everything. “I want chop me na nyamangoro!’. “If Batibo Coco no be fine coco then why the thing di still sell?”– My best quote in this album. Can you answer the question? It’s almost talking to me. Here is my angle: if you keep complaining about the government, then why is it still there? OR if you keep saying Jovi’s music is not good, why does everyone listen to/enjoy it? I get a slight Kendrick Lamar feel here…what about you? The music video will be huge. The beat is awesome. Wicked moves with a proper director and full throttled crew will be memorable. I think it is short though but then again, good things don’t last. Honesty seems to be his trademark. He is not scared of you and you know it. “ Give chop for massa…” segment. “Check the price on the shopping list, you will find that true love is still expensive”. If you know any other Cameroonian artiste who has this uncanny ability to utilize jargon effectively, PLEASE let me know. As at now, Jovi’s the King. “I don’t know you, you don’t know me either…my name no fit remain for your mop …the truth is bitter”. How smart is that!? See the pun? Resolve too. Like nothing can stop the D4K. Everybody (except yours truly ) loved this song when Jovi released some months back. There are many takes on this: watch for yourself and gauge. Make man no lie…I di jealous me yah….